Wings. Hunters out there, do you eat them? From a cook’s perspective, wings are among the most problematic parts of a bird; even a lot of chefs don’t much bother with them. Bony and tough, wings can be a lot of effort for only a little meat. For years, they were mostly tossed into soups or stocks. But then, sometime in the 1960s, came the wing’s savior: Buffalo wings. Buffalo wings originated in Buffalo, New York as a throw-together meal from spare chicken bits lying around. A classic case of necessity, mothers and invention. 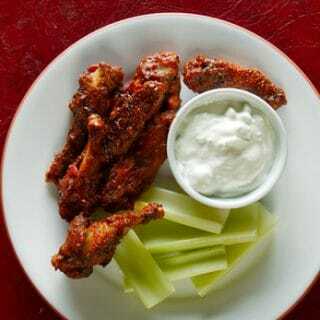 Buffalo wings have since become one of the most iconic bar foods in America because they combine salty, spicy, fatty, meaty, creamy… and cheap. Other than giblets, wings are the cheapest part of a bird to buy. Wings from both chickens and ducks can be had for less than $1 a pound in Asian markets here in Sacramento. You won’t find a buffalo wing recipe for chickens on this website. I don’t do chicken. And I’ve already developed a recipe for wild duck buffalo wings. That leaves my other favorite bird, the pheasant. 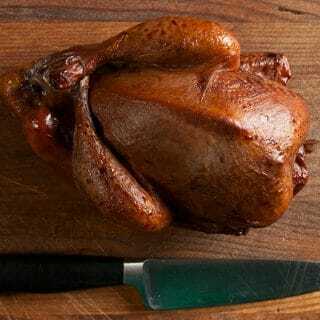 Know that pheasant wings will not normally be any tougher than those of a rooster, which is however to say that they’re a lot tougher than a wimpy little chicken you buy in the store. Pen-raised pheasants, for those of you who hunt game preserves, will be much closer to domestic chickens. What this means is with most pheasant wings, you will need to simmer them before you cook them like normal wings. Duck wings need to be simmered for several hours to become tender, but even old wild roosters need only about 90 minutes. You then roast the wings in the oven before eating them. Yep, roast, not fry. I just prefer my wings roasted or barbecued. I first had Buffalo wings this way at a restaurant on Long Island called Big Barry’s. Big Barry (who was a dwarf, apparently with a sense of humor) offered $0.12 chicken wings on Tuesday nights, so our cross country team at SUNY Stony Brook would routinely pile in and gorge ourselves. I once ate 67 wings at one sitting, at a time when I weighed 140 pounds. Ah, youth. 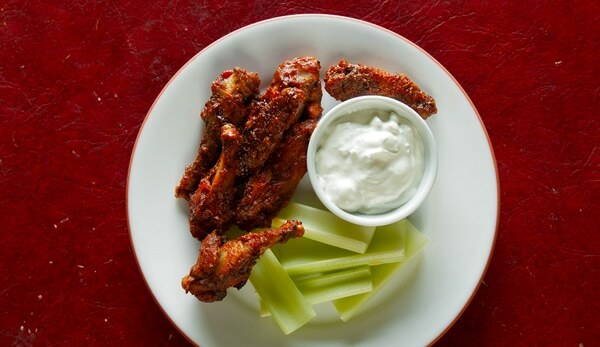 I can tell you these pheasant Buffalo wings get pretty close to Big Barry’s wings. A little par-cooking to make them tender, a quick marinade in the hot sauce and a slow roast in the oven or on the BBQ and you’re ready for football. Pheasant hunters, if you try this recipe I guarantee you will start saving the wings off your birds. Guarantee. After the par-cooking pheasant wings, which will take between 1 hour and 30 minutes, you soak the cooked wings in the hot sauce for an hour or so, then roast them in the oven to crisp. If you want to take them even further, lay out the wings on your grill and roast them over charcoal or hardwood. But beware if you do this: You will find yourself eating way more than you expect. In a Dutch oven or covered pot, submerge the pheasant wings in the stock; add water if need be to cover. Bring to a simmer and cook for 90 minutes and up to 2 hours — you want the wings to be very tender. Remove the wings and save the stock for another use. Pour the hot sauce, paprika, melted butter, and salt into a container and mix well. Add the wings, toss well to coat and marinate them for at least an hour, and as long as overnight. Preheat oven to 400°F. Place the wings on a baking sheet or two in a single layer and bake until they are crispy, 30 minutes. While the wings are cooking, pour the marinade into a small pot and bring to a boil, then drop the heat to low. Keep warm, and when the wings are done, toss them with the sauce before serving. Serve with your favorite blue cheese sauce, celery and lots of beer. You can find all sorts of recipes for pheasants and other upland birds here on Hunter Angler Gardener Cook! now that’s a good idea.. my son shoots most of the pheasants when I take him hunting, and he likes buffalo wings, this will make him very happy.. I usually simmer the legs for an hour or two with some ‘erbs and spices, then poach the breasts in the resulting stock. Pull the meat from the bones of the legs, saute with onions and mushrooms, reduce the stock and add. My fussy-eating sons like this. Finding a use for the wings as well is excellent. Doug K: Great idea on poaching the breasts in stock made from the legs! Probably. Never done it with breast meat.